Race riots aboard Navy ships carrying weapons of mass destruction. Imagine that. On U. S. Navy ships, oil tankers and aircraft carriers, racial unrest rose to the level of riot. Black sailors trying to hurt white sailors; white sailors trying to hurt black sailors; sometimes these riots happened at sea during Vietnam wartime operations. Most of this racial unrest occurred from 1970 to 1976. I served in the U.S. Navy from June 1972 to March 1976. In fact, as a sailor with Air Anti-Submarine Squadron 27 (VS-27), I was on board the USS Intrepid (CVS 11) during the race riot of January 1973. 5,000 men, on a ship carrying warplanes and tons of munitions; while at sea there were some black sailors and some white sailors randomly attacking each other by race. That riot and other racial incidents in the Navy are recounted in John Darrell Sherwood’s extraordinary book, Black Sailor: White Navy. Often, I have thought of those years of racial turmoil. Not only thought of, but used stories of that time when teaching my students about the social psychology of racial tension. When I have described the race riot aboard the aircraft carrier USS Intrepid, my students look at me in disbelief that such things could happen in one of the armed forces set up to protect American interests. Oh, I convince my students, but not because I have ever had a published source to point them too. Now I have a source. 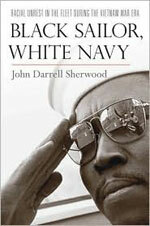 Chapter 1-3 of Sherwood’s book sets the racial context of the Navy. In Chapters 4-10 Sherwood tells of particular racial incidents (see chapter 10 for the story of the Intrepid) and how those incidents were managed and later investigated. For so long I have wanted there to be a public telling of the story of that unruly time in the Navy. My desire has always been because for me as a young black man, that time, those events were a crucible in my life. I was just at 21 years old when I went in and just at 25 when I got out. I learned so much. Those experiences led me to my profession. I found Social Psychology in the Navy. For a day and a half, I was sequestered in my house, reading Sherwood’s new book. As a scholar, I am impressed with Sherwood’s documentation, interviews and summaries of what he found and learned. More personally, in vivid ways, Black Sailor, White Navy took me back to that important time in the Navy, and in my life. Sherwood tells of that time with truth. Sometimes, I had to stop to let my emotions be a storm at sea. Sometimes I stopped to reflect on a memory that was rocking me from port to starboard; left to right. I was discussing this period in the Navy with a friend just yesterday over dinner 5May2010. I gave credit to Adm. Zumwalt for his no-nonsense approach to making the best out of a difficult social time in America and the Navy. I remember the 1974 changes after the USS Intrepid riot as a decent attempt to alleviate some of the tensions felt by most sailors. Thanks for your review. It brings back some powerful memories and emotions. I was an UPWARD trainer in San Diego 1971-72. It was an exhilarating and challenging time for us. I was with a west coast aviation squadron deployed aboard the USS John F. Kennedy (CVA-67) from December 1971-October 1972 operating in the Mediterranean. I was then an Aviation Fire Control Technician First Class (AQ1), a very technical rate. However, I was always fighting with the ship company personnel for equal opportunities for the junior black sailors. The ship’s captain labeled me as a “troublemaker.” I recall writing a letter to my congressman in Oakland, CA, The Honorable Ronald Dellums, warning him that if racial conditions did not improve on navy ships, there would be riots. Two weeks later, riots broke out on the USS Constellation. I was later assigned to BuPers as a detailer, and people often asked how did I get that assignment with my so-called “militant” reputation. In that assignment, I served on the Navy’s uniform board, and was able to influence realistic regulations on black haircuts. At BuPers, I was also able to give a black voice to black sailors all the way up the command. I also participated in many UPWARD seminars involving middle management up to flag rank. In one executive seminar for flag officers was the captain of the JFK, then an admiral selectee, and after the seminar, he said he finally understood my legitimate racial concerns while on his ship. I later made chief and chief warrant officer under a black commanding officer, Buddie Penn, who personally wrote my recommendation. When I was selected, Commander Penn had transferred to the Naval Academy as an instructor. When I called him and asked him how I could thank him, he simply said, “Help others.” I dedicated my career to doing just that. After I retired from the navy in 1981 as a CWO3, I worked civil service for the navy as a programmer and got to visit many ships. I encouraged the young black men and women I met on those vessels by telling them how we fought to open doors for them. I later taught IT courses in college and shared my experiences with white and black students. I shared how I came from segregated schools systems, but studied to score high on the armed forces battery exam and excelled in the military and later going on to earn a master’s degree despite having lost my voice box to cancer while on active duty. When I meet senior black enlisteds and officers, I admonish them to especially encourage those who look like us. I believe in helping all people, and my white and black students all knew that, but my black students knew that they had a special advocate in me. I often meet young black servicemen and women, and I share my experiences with them, letting them know that they can succeed in and out of the military. I encourage them to take advantage of the educational and training opportunities and never stop learning. I also remind them that the opportunities they enjoy now were bought by a price; a price of riots and protests by those brave enough to stand up to an unjust system. Captain Buddie Penn is now retired and serves as assistant secretary of the navy. He dedicated his entire military and civilian careers to helping people such as me move up the ladder. He earned his aviator wings in 1960 and flew A-6 aircrafts over Vietnam earning him the recognition of “A-6 pilot of the year.” Captain Penn did not afford me any preferential treatment based on race; he just afforded me an equal opportunity to compete. That is all we as black sailors ever demanded. It is sad that it took riots to make that known and gain actions. When I talk to sailors I realize that blacks still have not arrived in the navy, but at least more opportunities are there. I am glad we who served during those tumultuous years made a difference. There is no adequate way to show appreciation to you and others like you who came out of themselves to alleviate a debilitating condition (“stomach stones”) of those who did not know how to help themselves. Too many look upon segregation as an evil of the South, not as a very national evil. Were it not for champions like you, however, we would see that ugly head reared much more often than we do. Please continue your diligence. Your positive influences will reach more lives than you will ever know. USS Intrepid 1973. To check accuracy of those present consult cruise books for USS Intrepid (CVS-11) for the periods mentioned in the book. Also, consider checking the first case for LTJG Henry T. Wingate USN J.A.G. This will enlighten even those who were there and expand on their knowledge of what was happening during these dreadful days in USN history concerning integration and assimilation. I was writing a post for my blog and was recalling my experience as an UPWARD facilitator at Subase Pearl in 72-73. I think everyone who participated as RAFs experienced lifetime changes in values and views. I’m not so sure about the majority of white people who attended the seminars. I recall after each seminar we gave out evaluation sheets asking for comments. Funny, in most cases the comments were mostly positive immediately after the seminar. Two or three weeks thereafter however, the feelings seemed to change and soon the UPWARD seminars were being criticized as being racists in and of themselves. I think it was just a revolt against the thought that they could not accept what they saw in themselves during the seminars. Anyway, just wanted to say hi to another shipmate who did UPWARDS. Your style is so unique compared to other folks I’ve read stuff from. Thank you for posting when you’ve got the opportunity, Guess I will just bookmark this page. While doing some research for my blog I came across this article; good stuff man! Having enlisted in 1974, I too was serving during those difficult days. Reporting to my first ship as a naïve 18 y/o, I was unprepared for the racial tension that existed. Growing up in a suburb of a small Western Pennsylvania town with few African-Americans, I had little exposure to the racial unrest that plagued the county in the early days of the Civil Rights Movement. In addition, my parents were supportive of the movement’s goals and vehemently opposed to bigotry in any form, so I came to that cultural climate with a strong sense of tolerance, but without a framework in which to deal with my own feelings. Fortunately there was UPWARD and the ‘Rap Sessions’ that followed, both formal and later in the mess decks which allowed me to process what was going on and how I could be a part of the change. For the last 12 years of my career, I served on the Command Training Teams and delivered the Navy’s Rights & Responsibilities (MR&R) workshop to countless sailors on 3 different ships which evolved from the UPWARD seminars. Thank you Mr.Sherwood for writing this book! The comments from Lawrence, Williams and Palm really gave me the comfort I need so badly at this time in my life. I enlisted in the Navy under the deferred entry program in 1976 immediately after my 16th birthday. The experiences I had were so atrocious that I did everything I could to push them out of my mind while I went on to pursue my education, raise my family and move through my career. Now that I finally have time to reflect on my life experiences it has become increasing more painful to reflect back on my dark days in the Navy. The comments from Lawrence, Williams and Palm have given me the additional insight to see the negative treatment I received from a larger perspective and that perspective has helped me to turn away from asking myself what I did wrong or what I could have done differently to change the negative treatment I attempted to navigate. So thank you Mr.Sherwood for writing the book that lead to the comments that showed me I was not then nor am I now alone. I was onboard the USS Hassayampa during her riot in 1973. Just heard about this book. Not much of a reader but this is a most for me. After the riot I was fortunate to be selected to attend a seminar between blacks and whites. I came out of this learning a lot about the feelings and understanding of both. The things I learned I’ve kept with me and tried to pass it on to all. My father, then RM1 Johnny A. Currington, US Navy Retired, was mentioned in the book “Black Sailor, White Navy.” Information about his life prior to his assignment aboard the “Lady Lexington” would have explained more. Prior to his Navy enlistment, he was a paratrooper with the 101st Airborne, US Army. This time in America’s armed forces were turbulent to say the least. Even the miltary family housing was segregated! I now understand more about what he gave up and sacrificed. There were racial fights back then. Personally, I think it was stirred up by the Black Panthers and their hate rhetoric. Too bad…a lot of young men got in a lot of trouble for buying into that stuff. There was racism in the Navy, and a lot of it. We had a captain on the USS Paul Revere, 1969-1970, who openly hated the black sailors. I recall him reacting angrily when one of the lieutenants told him a black SM1, who had just reported aboard had a Secret Clearance. He did not like having black sailors working in the operations department, and once criticized the SM1 at inspection for having his shoes shined too much. There were no minority officers…all white. Filipino sailors were all in the stewardsman rating and limited to working as valets in the wardroom and officers quarters. Promotions for them were few and far between. Admiral Zumwalt became CNO and started changing that, but there were continuing incidents. Slowly things changed for the better. Just before I retired, I went out on the USS Kitty Hawk in 1994. One night in the CPO Mess I observed that half of the khaki in there were Filipino, and 2/3s of the super chiefs, E8 & E9, were Filipino, and they weren’t in the shops service ratings. They were the yellow shirts…guys that made things happen on the flight deck. My dear friend Jack Gaham was on the Intrepid during this period. He was alo Zumwalts driver for a bit. What a strange time for his life. One I am not sure he ever will forget. BLACK OFFICER, WHITE NAVY by LCDR Reuben Keith Green (Amazon books) picks up where Sherwood leaves off. My father served in the Vietnam War Navy, and I served from 1975 thru 1997. The book is my story of what it was like being a black sailor and officer after the Navy’s promise to treat all sailors equally. Some promises are not kept, as you will see. I retired as a SWO Lieutenant Commander, but it was a sometimes “rough seas” environment. The late 60′s and early 70′s. I was in the DS rating learning computers in “A” school at Mare Island, CA. in 1970. I applied for a program called Broadened Opportunity for Officer Selection and Training(BOOST). I was interviewed by a LCDR who turned me down flat for the program even though I met the criteria. He told me that I did not deserve the program because I was black. The program was for academic training toward becoming a commissioned officer. I was disappointed by his refusal to forward my application for consideration for the program. Prejudice was the way then. I also went through a riot aboard the USS America CV-66 while in-port in Subic Bay in 1972 while we were in for repairs. Bad scene in the hangar bay while returning from liberty to beat the midnight curfew.